HP builds large-format inkjet printers for corporate clients, print service providers and others with high print volumes. Purchasing a printer in this category is an important decision. HP’s latex technology offers excellent quality and reliability and, with the right print volume, outstanding economics. 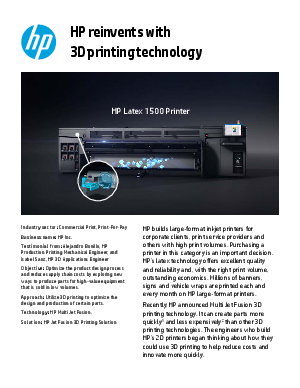 The engineers who build HP’s 2D printers began thinking about how they could use 3D printing to help reduce costs and innovate more quickly.